I’ve been getting more e-mails and comments recently asking it these water drop photos are “real” or photo-shopped, and how do I take them. They are of course real, and out there all the time -- just so small they are hard to see. The physics of it all, is that when water forms a drop, it no longer reflects back what is in front of it, but acts as a lens and refracts what is behind it. If you still don’t think water drop shots are real, just go out after a rain and hold a brightly colored piece of paper behind some drops and you will see the drops take on the color. The basic trick for taking interesting water drop photographs is to find big drops after a rain on a humid day with no wind AND with pretty things things behind them, and get the dang shot in focus with a nice composition. ;> As I’ve been trying to improve my drop shots from novelties to artistic photographs, I’ve noticed the key is not just shooting a pretty drop, but creating a well composed background with good color and rule of thirds and proper bokeh to show off the drop. This requires making little shifts in perspective as you gaze through the viewfinder to find interesting contrast, and playing with several aperture settings to get the right depth of field and bokeh. 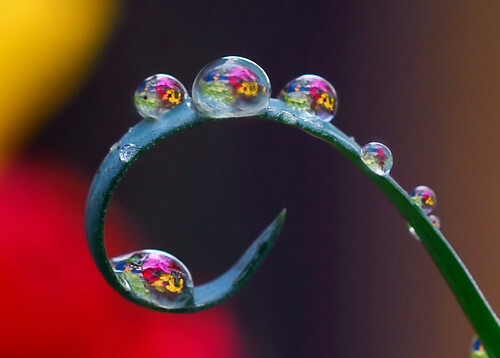 In most cases I like to go out to my garden after a rain and look around at whatever is blooming and discover natural teeny-tiny views of it through nearby drops. You just can’t control where drops will form, (even with a mister bottle they will roll off an interesting area but cling to something boring) so for me it’s usually more productive (and more fun) to simply explore the views and angles of natural drops around bright flowers. In this photo, I found some very interesting drop formations, but they were not close enough to anything colorful to make photo-worthy refractions. So I posed this shot by picking some small flowers and setting them behind the drops. I included spiderwort for the dark blue and yellow, climbing roses for the red, buttercups for yellow and some little pink border flower for the ….well, the pink. Anyway all this color made a great water drop, but the background was way too distracting so I had to move the mini-bouquet to the side. This caused focus challenges in the unforgiving macro world, but did create a more appropriate background with just a little color-interest on the sides to better compliment the drops. Sometimes having perfect focus of the object refracted in the drop is desired, but sometimes its much better to have a more abstract or dreamy less focused colors. Thank goodness for the digital filmless world, as there is so little that separates an ordinary water drop shot from a fascinating one that I try dozens and dozens of different settings and many angles hoping for the right focus, depth of field, shutter, contrast, bokeh, composition, and so on. Hmmm, maybe it *would* be easier to just photoshop little flowers at different angles in all the little drops… ;> Take care all, and good drop hunting!